What is it about THE VERY HUNGRY CATERPILLAR? Caterpillar pops out of egg. Caterpillar eats a lot. Caterpillar gets a stomachache. Caterpillar builds a cocoon around himself. Caterpillar becomes a butterfly. Caterpillar sells the second highest number of picture books of all time (and keeps inching towards Peter Rabbit’s 67-year head start). 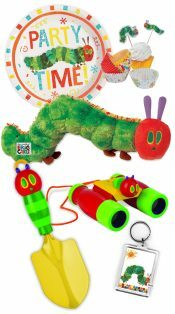 But there’s more: this hungry little caterpillar has appeared in the form of paper plates, hand shovels, cupcake wrappers, binoculars, key chains, stuffed animals (one of which is proudly owned by this blogger), and too many other products to name. Why? How has such a basic story left such a deep imprint on our hearts and imaginations? 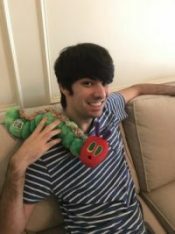 What is it about The Very Hungry Caterpillar? Personally, the book reminds me of the joy and discovery that seems to go hand in hand with childhood. But is that just nostalgia talking? Surely there has to be more than that. I may cherish the other books of my youth, but I have this particular sense of wonder towards that little caterpillar and his big appetite. So let’s start there: the hunger. Children don’t lack for hungry characters. Winnie the Pooh, Cookie Monster, and Garfield have happily stuffed their faces for decades, to the delight of young people everywhere. The satisfaction of good food is a basic thrill, and the hunger for more is a universal drive. 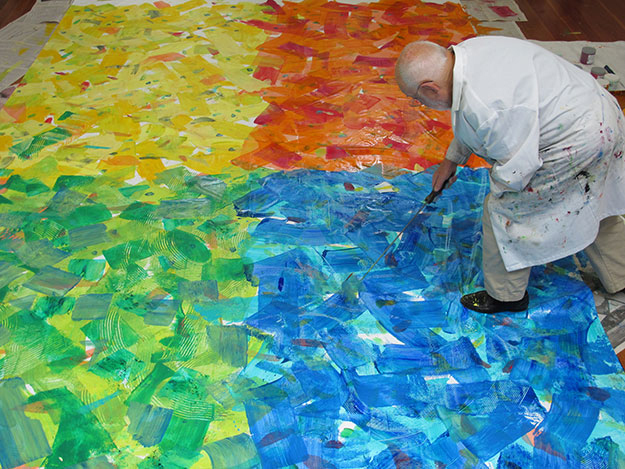 Eric Carle evokes these elemental feelings simply yet viscerally. Who can forget the excitement of feeling those small holes in the book’s pages, the gradual escalation of the foods, and the soft humor when the caterpillar overdoes itself and munches through cake, pickle, salami, and beyond? That playfulness resonates with children and the inner child of adults, and it brings out the best in Carle’s artwork. Anything is possible in his illustrations; you never know if you’ll encounter a purple cat or a blue horse, or a caterpillar with wide, infant-like eyes. And Carle presents all of it through that beloved childhood form, brightly colored collage. In a video celebrating Caterpillar’s 45th anniversary, Carle happily remarks while recreating his signature character, “Just like in kindergarten.” He may possess the attention to detail of a seasoned professional, but Carle’s artwork shows that any child – with practice – can become an artist like him. Indeed, Carle believes that both Caterpillar’s pictures and words alike serve to show children that they are capable of doing wonderful things. That rings true to me, though I’ve never consciously thought of it all these years, nor did Carle when he wrote the book. But that’s part of the book’s beauty: it never preaches to the child, never moralizes nor embellishes. It presents, simply, one of nature’s tiny miracles through the eyes of an adult’s loving wisdom and a child’s colorful imagination. To a child, it shows that transformation is possible, that exciting changes await them. To adults, it preserves that magic of childhood, of innocently crawling along the ground driven by simple needs, discovering the world along the way. 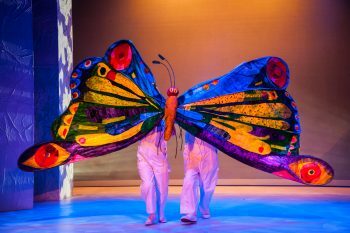 While THE VERY HUNGRY CATERPILLAR SHOW is being performed on the DCT stage, I encourage those who know the book to bring their loved ones and relive their memories, and I hope unfamiliar audiences will treat themselves to Eric Carle’s world. I’m willing to bet each of these groups will leave inspired, empowered, and treasuring the experience for a lifetime. To learn more about THE VERY HUNGRY CATERPILLAR SHOW and to purchase tickets, visit dct.org or call the DCT Box Office at 214-740-0051. Ryan Diller is a DCT Guest Writer. He is the former Web Editor of 1966: A JOURNAL OF CREATIVE NONFICTION, and his writing has appeared in MULTIBRIEFS and HOT PRESS. He is currently working towards an MFA in Playwriting at the University of Calgary.